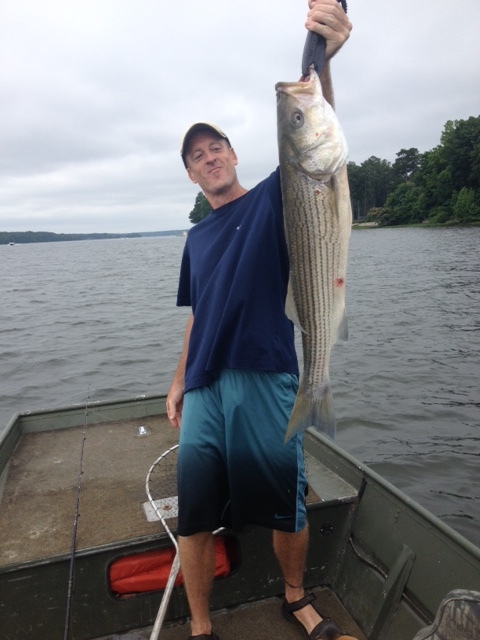 Big white bass and stripers were feeding good yesterday afternoon. I got a call from Captain Stu Dill yesterday afternoon. He was on the lake and the fish were chewing. He had two white bass in the livewell and had already caught a largemouth bass and a crappie. I got a few rods together and jumped in the truck to join him. It had been raining off and on all night and throughout the earlier part of the day. It was cloudy, the barometer was moving and there was a front stalled just off our coast. I’m currently in the second round of editing on my book; this time with the publisher’s editor (so it’s easier now after the majority of the work has been done) so a break from the keyboard would be a nice distraction. I got aboard in the early afternoon and we put the hammer down to cross the lake and drop lines. We went to a spot that’s been producing a few striped bass, but nothing was happening after a few passes watching the sonar. So we motored to the area uplake where Stu had been catching earlier. After a few minutes of trolling we put the fourth species of the day on the boat; the scourge of the lake; the notoriously voracious white perch. We found them on humps and started catching them 2 and 3 at a time. It was fairly steady action for a while and after only landing one channel catfish aside from the myriad of perch, it took some discipline for us to leave those fish biting. They were stacked on humps just off the sloping red-clay banks that lined that part of the watercourse. But we knew where we needed to go. So we made the run back down to another area we’ve been checking lately and after dropping one rod back we started running too shallow, but as I was reeling up some line the rod doubled over in my hands. It fought like a striped bass, shaking its head violently, but after a few moments I saw the taller profile with the stripes and brought a nearly 15″ fish taco into the boat. I just love everything about white bass. They feed readily in the right conditions, fight like crazy and make excellent table-fare. Especially fried in peanut oil! So now we had three nice ones already in the livewell. After another pass we hung the first striper (feature photo). It fought hard as it took the crankbait, which was all we caught fish on all afternoon, they wouldn’t touch bucktails of any color, spinners or a Bama-rig. The fish was just short at 19″, but we made the call to put it in the livewell a few minutes to recover. To hell with the ticket if the warden would rather we throw it back to die. Striped bass can’t take the struggle and being thrown back into hot surface water right after the fight. So we took the chance and let it go when we felt it would live. And it did. Right to the bottom! If you can get them past that first 5 or 6 feet they’ll usually do ok.
We started catching perch again and a few more nice white bass before calling it a day. It was a 6 species outing with steady action all afternoon and I took home 5 fatty white bass for a fish taco dinner. 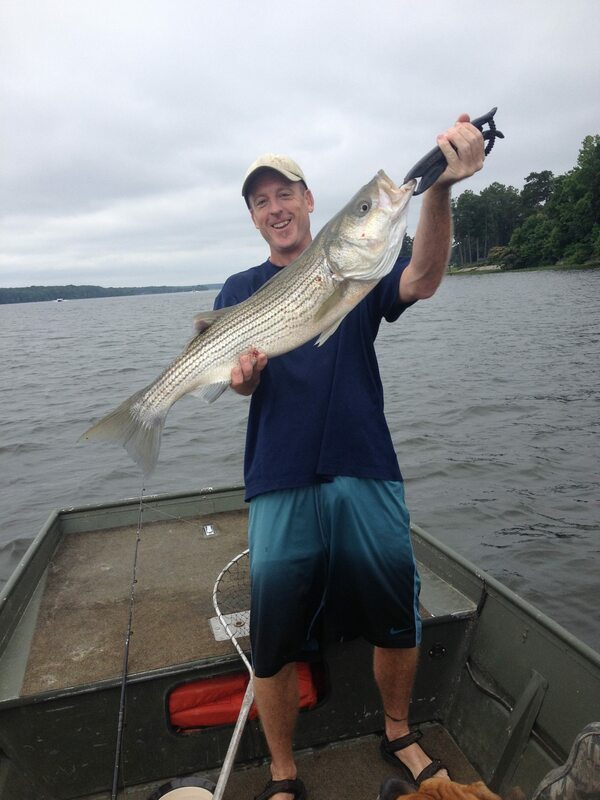 The striped bass have continued to be active on Gaston Lake, so I headed up last Friday to try my luck again. After a few hours of searching last weekend, I’d found a large school of schoolie stripers near the back of a long creek on the lake. I didn’t expect them to be in the same spots, but to my amazement, they were not only still there, but there seemed to be more of them. These young striped bass are ferocious when it comes to attacking baits and even more so once landed. Anglers should be very careful when handling stripers, young or old, these fish are full of piss and vinegar long after you’ve fought them to the boat. I hadn’t been on the water twenty minutes Friday afternoon when two of four rods doubled over on the first pass. I fought both fish to the boat and happened to land them on Capone’s bed. He was nowhere near as thrilled as I was with the double hookup. Both fish hit crankbaits and were positioned in fifteen FOW on a hump in twenty-two FOW. These young fish are truly beautiful specimens, and are likely naturally spawned fish. 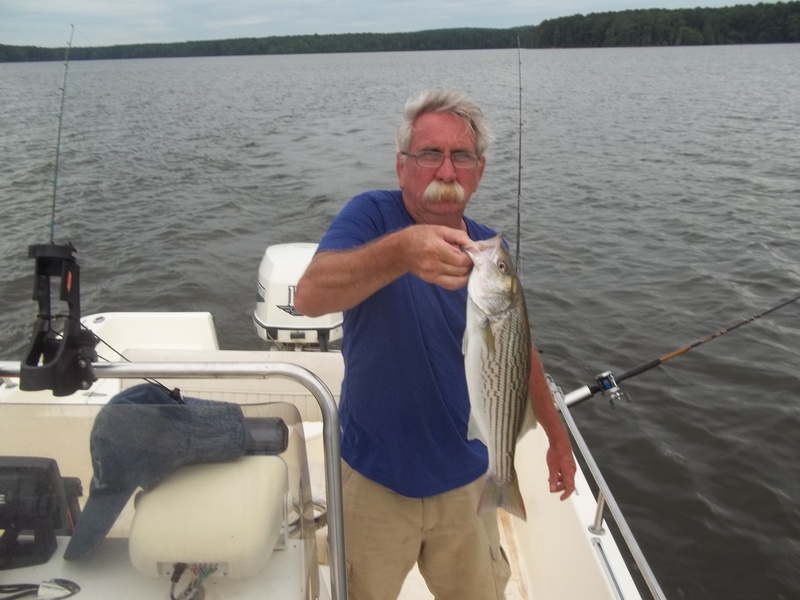 Gaston Lake has a very healthy, naturally-reproducing population of stripers. The colors are slightly crisper on the smaller fish, much like reptiles, young striped bass’s hues really pop in bright sunlight. You can see purples, blues and even pink shades in the white areas on the younger fish. That afternoon was filled with multiple striped bass hookups, and I boated a ton of perch too. There was a good size class of white perch feeding in the same areas the stripers were occupying. I fished til sunset and called it an afternoon with plans to hit the water early the next morning with my Dad and stepmother on their boat. The next morning was calm and started off with cloud cover. It was perfect. We knew the lake would get extremely busy sometime around midday since it was a holiday weekend. So we got out at dawn and quickly started catching fish. I offered to drive their boat and just let them catch fish and they graciously accepted. We started off slow, only catching white perch, but it was steady action, and we had a few doubles that kept my family engaged in the outing. Then, we came across the school of striped bass one time and they each landed one. Shortly afterwards my father landed a largemouth bass and a few more perch as well. After a few hours the traffic started picking up and we opted to break for breakfast. But after we got back to the dock, I couldn’t stand it (of course) and decided to take my boat back out for a while. I don’t know what it is, but my Alumacraft is just a striper magnet. I hadn’t been in the area a few moments and dropped three rods back, all with crankbaits attached. I was preparing to drop a fourth rod back when all three rods doubled over at the same time. I wasn’t even in the most productive areas at the time. But in short order I boated a triple and snapped a quick pic. Two of the fish were fairly small, but the third was close to the 20″ minimum. Regardless, I released all three of them and kept after it. I trolled around another few minutes and hit the school a few more times, which resulted in more short fish; then started catching the perch again. Once they started I couldn’t get the baits down to the linesiders anymore. I even had a few perch quads! It was hilarious and the action was so steady, I started just fishing with two rods out. The traffic made it hard to troll and even harder to do anything besides hook the fish, fight the fish and toss them back in the water as fast as I could. After perhaps another hour or so boat traffic got so steady it was impossible to fish the lake, so I decided to join the revelers and enjoyed the afternoon. There was even a pizza boat! All in all it was a really fun couple days of fishing, and we even had a great time giving up the water to the jet skies, wake boarders and skiers. Sometimes you have to just join the park-tanners and fish in the early and later parts of the day. Those are the most productive times of the day anyway. I caught all my fish on crankbaits this past weekend. I’m sure they would have hit other baits, but when a crankbait bite is on, it’s as easy as it gets. The fish were still hitting in shallow water in the creeks and I found no fish on the main lake. The larger fish are still working their way back down lake, as they have been spawning in the river. But I would guess the big fish will be hitting the main lake in the next few weeks. Stay tuned…. The striped bass have started biting on Gaston Lake, so Capone and I got out there this past weekend to get in on the action. I had a little time Friday afternoon and got on the water about 4:00. First, I rode around and checked as many areas as I could before the last hour; places I’d caught stripers in spring there before. I’d caught a few largemouth bass on big #5 inline spinners in 50′ of water on the main lake as soon as I’d got to my first area. They always bust there in the afternoons when it’s warm, there’s low boat traffic and calm. But I hadn’t located any striped bass. I planned to head back to Pea Hill Creek and hit a few more points and humps before sunset. It was warm but the cloud cover was well received. I passed under the bridge and started into the creek and quickly saw good marks on the sonar in 20′ of water. Nice marks with lots of color. So I dropped lines and started trolling, but as soon as I’d started the wind really picked up and a light rain accompanied it. The sun was peaking through at times and the cloud cover’s colors varied from dark, likely rain holding clusters to light and smooth, low-lying cirrus and cumulus puffs hovering at all heights. It was too windy to troll where I was, so I took off across the creek for cover. The plan was to wait out the weather and then get back to fishing before dark. And after a few moments I was about to anchor up in a windbreak when fish started busting around a point near me. I dropped the anchor back in the bin, started the boat and carefully got to within casting distance of the commotion. I had a rattletrap tied on a braid pole and soared it at the boiling water. One dip and a striper was on. I snapped a pic and tossed the schoolie striper back into the lake. Then, after a few more throws the fish stopped their assault on the shad. I saw lines on my sonar and opted to start trolling the area. The fish were in shallow water and were positioned in the slot of a cove near an island; so trolling was going to be difficult, but they weren’t hitting anything else. It’s a good thing I decided to risk losing gear, because I didn’t lose anything, but man did I get on a school of short stripers. I had maybe a three-hundred yard run that ended at one end in a cove and the other in deep unproductive water, and had to navigate two humps that came up into 5′ of water. The fish were active in 15′. I was pulling my gear on leadcore with two colors out, which put me at close to 10′ with the lures. There was also the slot to deal with; I had to turn through both humps and hit the slot where the largest portion of fish were positioned. It was tough but I didn’t hang once. First, they were hitting the ‘Bama rig. Then, the fish tossed any qualms they had with color, shape or size and hit everything I trolled by them. I didn’t measure any of them as I could tell they were short of the 20″ minimum, and I only snapped pics every few fish. The action stayed on fire for a good hour and I fished til dark. I probably caught 15 to 20. Here are the rest of the pics I took that afternoon. So the sun set on that day, but I decided to wake up at 5:00 am and get back out. I was hoping some bigger stripers would join the party. It was basically a repeat of the previous day. No keepers, but a ton of fun action and Capone got in on the party!! I had planned to help Pop out with a few things at the lake house at midday and ended up helping a neighbor with a little labor too. Then, we were gona head back out but another freakish windstorm cancelled afternoon fishing plans. So me, Pop and his wife just enjoyed the cooler weather on the porch and watched the hummingbirds. They’re just starting to visit the swings and feeders up there. There may have been a few cold beverages too. We thought about fishing again Sunday morning, but I figured that school of fish was tired of my harassing behavior, so I just woke up, put the boat back on the trailer and headed back to town. People who know the lake wouldn’t believe me if I told them where these fish popped up. Never seen them there before and probably never will again. But it was a lucky coincidence of stripers hunting and baitballs escaping wind and current, and I was happy to have experienced and learned from it. I’ll be back there soon when the action hits the main lake. So this afternoon was a no-brainer to go after some slabs. I wanted fish tacos and I was lucky enough to find the ingredients today. The weather was what I call perfect for fishing. Light winds, overcast, rainy-at-times and cool with constant approaching weather. I got on the water around 2:00 and started catching fish right off. There was bait on top of the water, but I never saw any surface activity. I launched and headed into the back of a cove I’ve had plenty of luck in over the years and hit a keeper striper before I could get all three lines out. I had two rods spooled with leadcore already out and was dropping back a crankbait in the center of the spread when the first rod doubled over. It was a decent fish and fought hard, digging deep repeatedly in 20 fow. 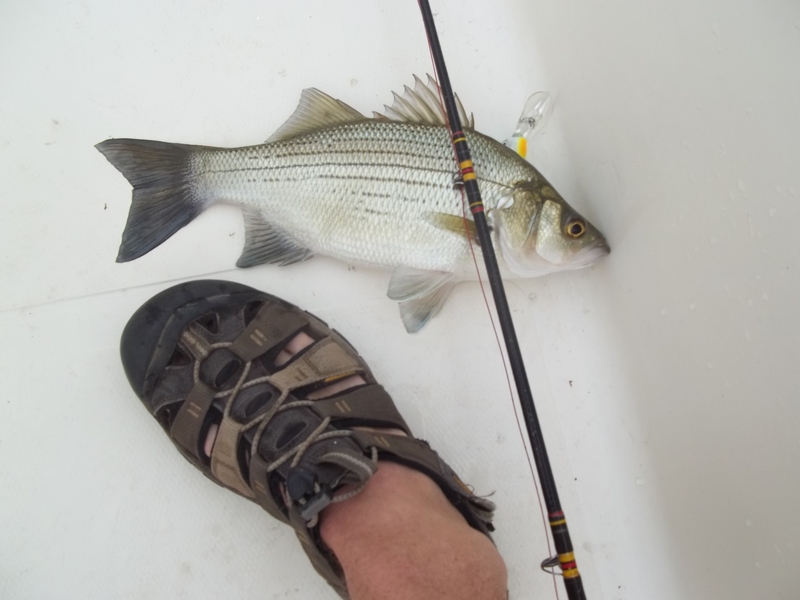 I lip-gripped the striped bass and brought it into the yak. It was about 21″, so I took a quick pic and released it. I was only planning on keeping whites or crappie. I trolled through the area a while and picked up a few small catfish before landing the first white bass. I thought it was a striper, as usual with the bigger whites. It was almost 14″ (feature photo) and hit the ice. Then, I trolled right back through the same spot and hit a nice crappie, just about 12″ and it too joined the white bass. Then, the sun popped out, the temperature went up and the bait and fish vanished. The wind picked up a bit too, so I trolled across the lake and hit a different area. Once there, I found fish on structure and started jigging after a few passes with no takers. I caught several bream, with one nice one first. I thought about keeping them, but turned them back. Then, I caught another striper, it was short and also quickly released. The afternoon started getting late and I was headed back to the ramp and the wind died. The clouds covered the sky again and I decided to tie on a chugbug. I love those things. Rivers, lakes wherever. I chucked it along a bank a few times and had one blow up. I figure it was a maybe two pounds, but it was fun for the sixth species of the day. After that the wind started up again and I split. Only kept the crappie and white bass but it was just enough. I love overcast calm days on the water. Saturday, a good friend and I decided to launch on the Roanoke River in search of river-running striped bass. We set out in Williamston NC and headed upriver. The current always seems to be strong there, but that day the water was clear compared to my previous trips. We’d planned to travel to Plymouth, but the shad report was good where we were, and with decent water clarity, we opted to go ahead and fish. We didn’t leave early by any means either and weren’t on the water til nearly 1:00. We threw shad darts in white and chartreuse from the bank and had chasers nibbling as well, but they wouldn’t commit. So I tied mine on with a 1/2 oz trolling weight and let out plenty of line once we’d launched. The water was fairly deep, so I put out another line with a white sassy shad and a chartreuse jighead and headed hard into the current. I wasn’t two-hundred yards up the river before I hooked my first shad of the year on the troll. It put up a great fight and I snapped a pic once I landed it. I continued upriver and it wasn’t long before a striped bass hit the sassy shad. It also put up a great fight and the current had me turned quickly. I thought I’d lose the other line and lures to the bottom of the river, but I was lucky and pulled them in after landing the striper. I took a quick pic and released it. I didn’t measure the fish, but I didn’t plan on keeping any unless they were at least 20″. It may have been a legal 18″ fish, but I decided to let the first one go. Shawn and I continued upriver again and after a while of fighting the current we found a great spot to try cut bait. We tied Carolina rigs and sent out baits into eddies and currents, but found no more striped bass. We did find a great bend in the river that gave us action until we left however. We caught plenty of catfish. They were the whitest channel catfish I’d ever seen. The fish were suspended in deep water, almost 40′, and we anchored on the point nearby and fan-casted the area. We caught several of these guys and released all of them. Then, we tried to search further upriver and trolled a ways again. But the boat traffic was heavy and we soon started running out of time. So we headed back to the area that gave the most action and that’s when Shawn hooked into the big gar (feature photo). I’d had two on prior to his hookup, but each fish came unbuttoned before I could get them to the boat. I paddled over to his position to get a few pics. Then, when I paddled off, he reeled in his other line and saw another gar take the bait at the boat. He fought that one and landed it too. That was the first gar-double I’ve ever witnessed. The day had grown old by that point and we hadn’t found the striped bass in any numbers so we decided to call it a day and made the drive back to town. We honestly didn’t see anyone catch a fish yesterday and it was one of those afternoons when you saw the same boats running all over the place. Although, we were told the bite had been good. And I don’t doubt it, the fish don’t always know how nice a day it is. But we’d had plenty enough action to have a good time. I advise anyone interested in this years striped bass run on the area rivers to check these shocking reports weekly. They update them pretty regularly and you can use them to plan your trips with an edge. They feature the Tar, Roanoke, Neuse and the Cape Fear. It’s tough to fish Gaston Lake on a holiday weekend. It’s even tougher after you spring a leak in your boat after treating it an unkind manner. 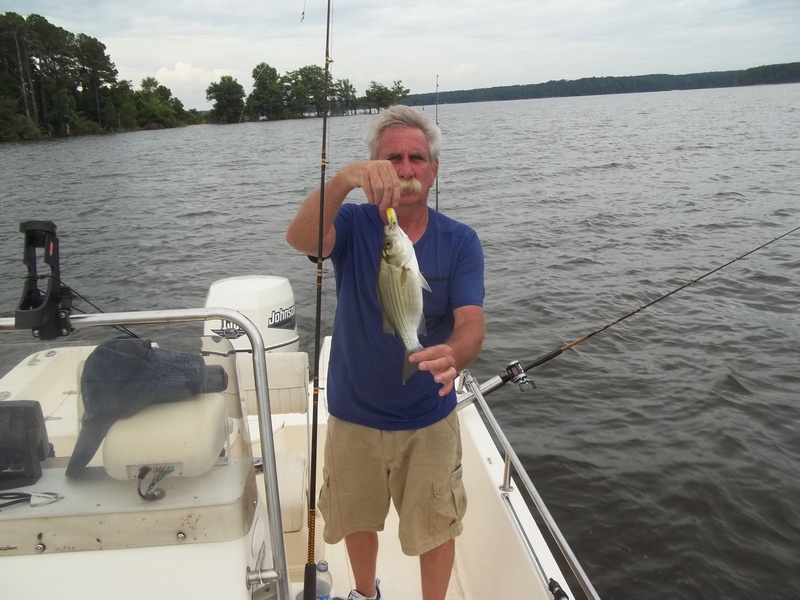 I decided to hit Gaston Lake for several days and knew it would be tough to fish much at all. So I went with the attitude of just rolling with the park tanners and taking what I could get as far as fishing. I caught a few dink bass and stripers Friday afternoon before the masses hit the lake. But nothing of any size, and thunderstorms ran me off the lake early too. Saturday morning was a repeat of dinks along with a few nice blue cats. After beating my skiff up a good bit just riding around and enjoying the cool weather on the water after fishing, my friend noted a leak in the front. Like a 2” crack. I put the hammer down and got back to my truck in short order and trailered the boat. I remembered fixing a radiator years ago with JB Weld. It held for 6 years and I figured if it could do that against heat, water and pressure it could seal a popped weld on a metal boat. So me and Pop hit the hardware store, (lucky they were open) and purchased the goods. It takes basically 6 hours to set good so I cleaned the area and applied the weld. So fishing that day was done. The next morning I put the boat in the water but there was still a touch of water coming in, but 90% stopped. But I looked out on the water saw jet skis already circling and decided to just fix it right. I could see I needed to go another ¼” to seal the crack. I made the additional repair and was on the water in a dry boat by 4pm. I ran straight out of the creek and hit the main lake. I knew where the fish were so just got there and dropped lines. 10 minutes into the troll one of 4 rods doubled over violently and I grabbed the rod. The fish fought like a huge striper but I hoped it wasn’t another blue cat. I fought the fish as best I could to the boat and asked Raixa to grab the net. She’d never netted a fish like this in her life, so I told her to just go lower than she thinks she should and mentally crossed my fingers….After a nervous few seconds boatside the fish was in the net and I was kinda shocked. She was 32” and 14lbs+. We both kinda freaked a bit and after a short celebration and a few pics that fish went on ice. Raixa got one heckuva fight outa that fish. But I wanted her to get her first rockfish. Then after another large circle I ran thru the area again and hung over another rod. And when I grabbed the rod it was shaking so hard I thought it was probably another striper so I gave Raixa the pole again (even tho it was my turn lol). 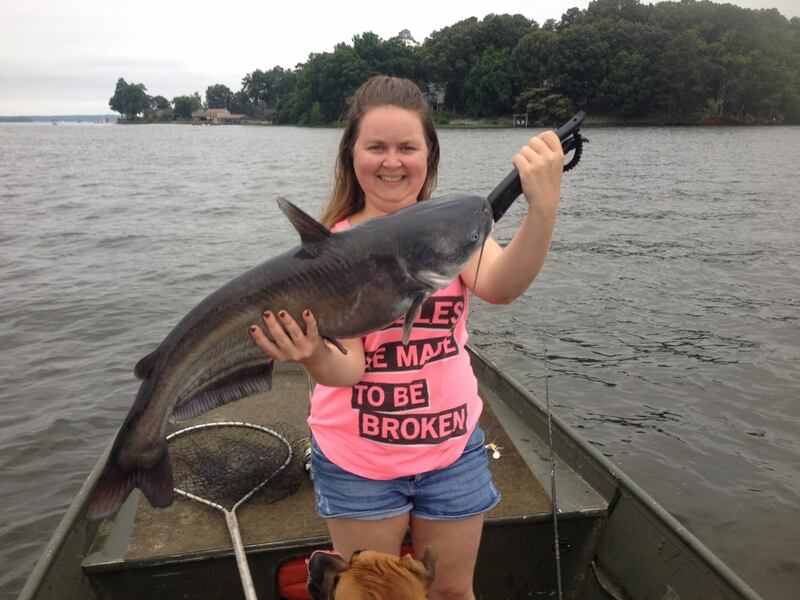 But again it was another big blue catfish. She was still stoked (and bruised) after fighting 2 big fish. We went ahead and released it and after another hour without a bite and knowing we had about an hour of light left we hit an area close to home I’d caught a few shorts at earlier in the trip. When we got into the area the water was slick and I dropped 2 leadcore rods and within seconds there was busting fish off to our left, then the first rod doubled over and I gave it to Raixa again and she reeled in her first striper. It was only around 17 or 18″ so without thinking I did what I would normally do in that situation and chucked it quickly back in the drink. Duh. No pic of her first one but she was fine with it. Then another rod went over and I reeled in a smallish largemouth too. We trolled another few minutes but the bait and fish split quick-like. It was about dark too so we reeled in the lines and hit the house. I had a nice fish to clean for a 4th of July dinner. I could already smell the lemon and Old Bay’s, and it was good.